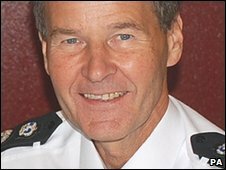 British Transport Police Chief Constable Sir Ian Johnston has been appointed head of security for the London 2012 Olympics. During the Games he will be responsible for overseeing security inside the Olympic venues, villages and transport. Sir Ian said: "Security is a vital part of ensuring we host a spectacular and successful event." Last month the government approved a further £19m to strengthen Olympic venues against terrorist attacks. The money is intended to make the venues in Stratford, east London, more blast resilient. The overall budget for the 2012 Games has been set at £9.325bn. Sir Ian, who has 44 years of police service, has become the director of security and resilience for the London Organising Committee for the Olympic Games. He said he was "very much looking forward" to "meeting the challenge" of the role. Beijing - a hard act to follow?